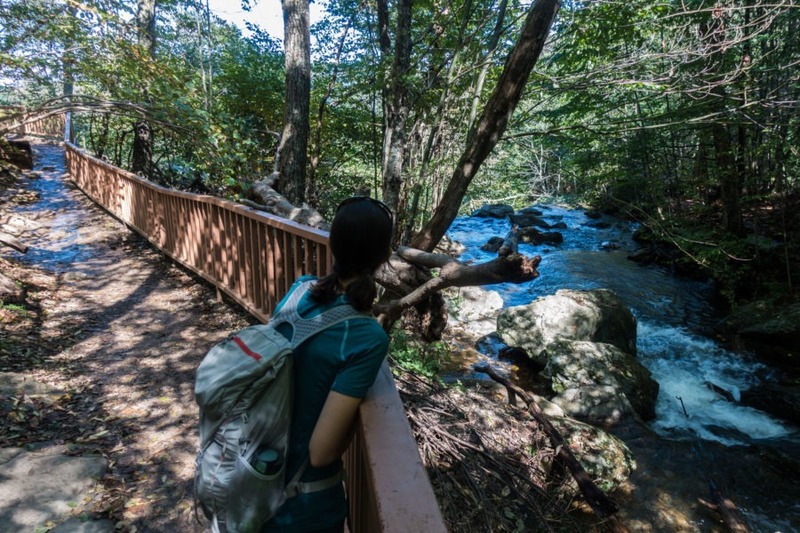 Rose River in Shenandoah National Park has been on our to-do list for awhile. Several attempts in the past floundered due to laziness or something coming up at the last minute. We’d made it to Mathews Arm Campground for the weekend, so we took the opportunity to finally hike Rose River Loop. The hike is located off Skyline Drive in Shenandoah’s Central District, across from Big Meadows Campground. We decided to make a 5.1 mile loop that included Dark Hollow Falls. We prefer loops over out-and-backs because we don’t have to hike a section more than once. 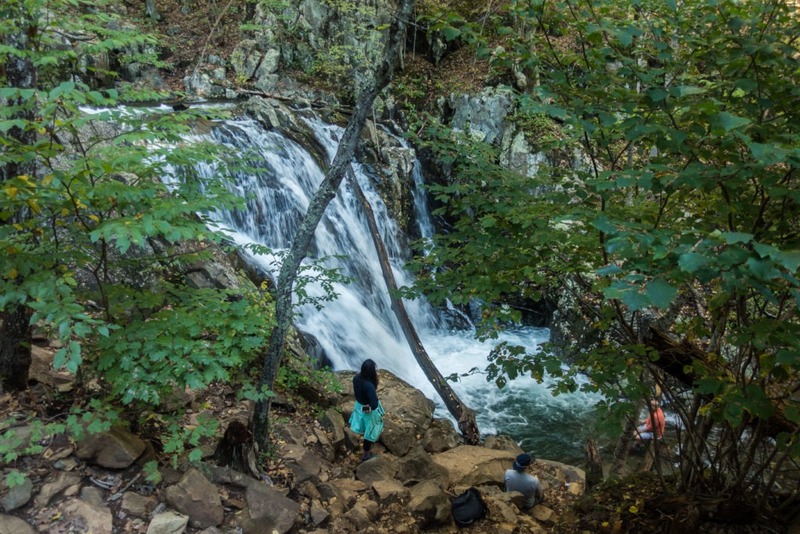 Dark Hollow Falls is a spectacular waterfall, and a short hike from Skyline Drive. Naturally, it was very crowded when we visited. 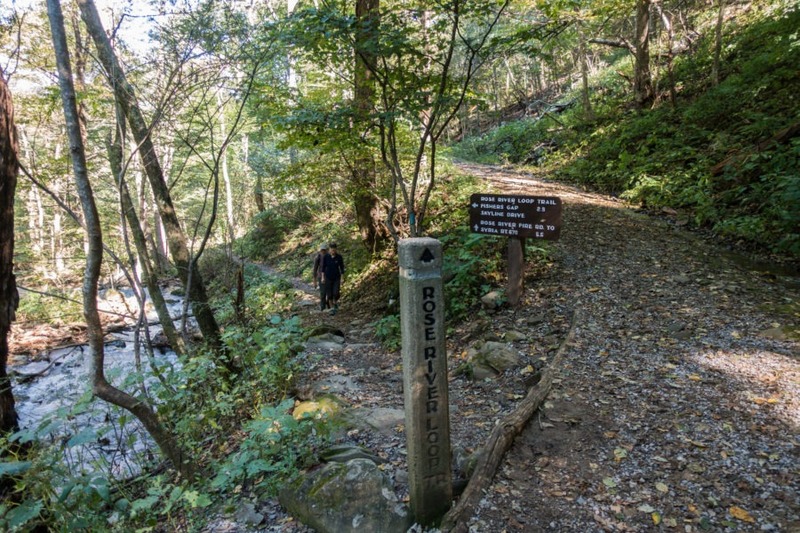 There were two options for parking: Fisher’s Gap or Dark Hollow Falls trailhead. 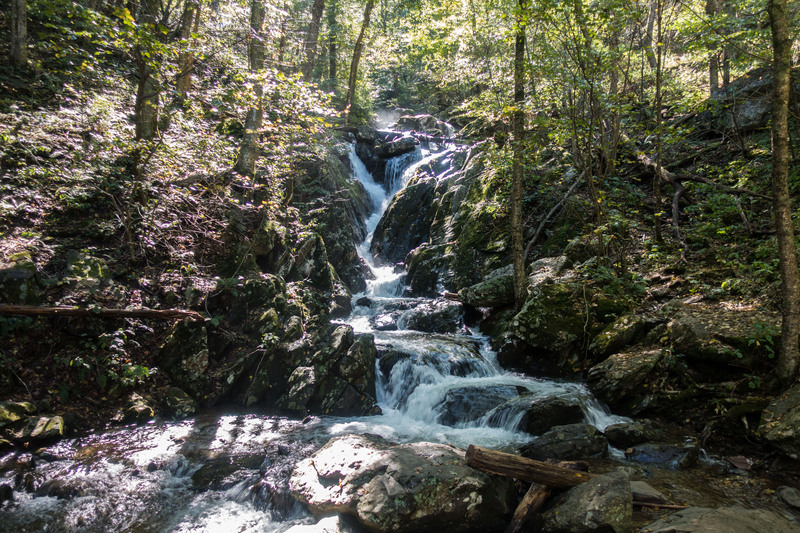 Fisher’s Gap is located around mile marker 49.5 on Skyline Drive; Dark Hollow Falls is at 50.5. We decided on Fisher’s Gap, because it was the first parking lot we encountered as we drove south from Mathew’s Arm Campground. We also figured Dark Hollow Falls parking lot would be full, since that section of trail is very popular (spoiler alert: it was). For that reason I’d recommend parking at Fisher’s Gap. We turned onto a dirt road near mile marker 49.5. The small parking lot was full, but this wasn’t Fisher’s Gap. It was access to Red Gate Fire Road, though a gate blocks vehicular access further in. Next to it is Fisher’s Gap Overlook, a paved parking area that had plenty of available spots. After parking, we walked south toward Skyline Drive, passing the Appalachian Trail on our right. 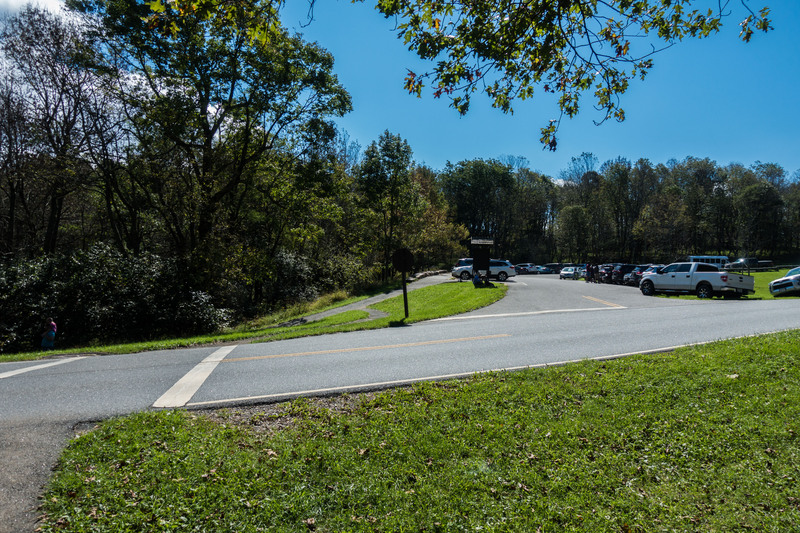 When we reached Skyline Drive we saw the crosswalk for Skyland-Big Meadows Horse Trail, where our hike began. Skyland-Big Meadows Horse Trail as it crosses Skyline Drive. We started the hike on the right side of the road. We walked on the right shoulder of Skyline Drive, and then headed uphill on the yellow-blazed Skyland-Big Meadows Horse Trail. Though we didn’t see any horses nor any…evidence of horses. Only other hikers. 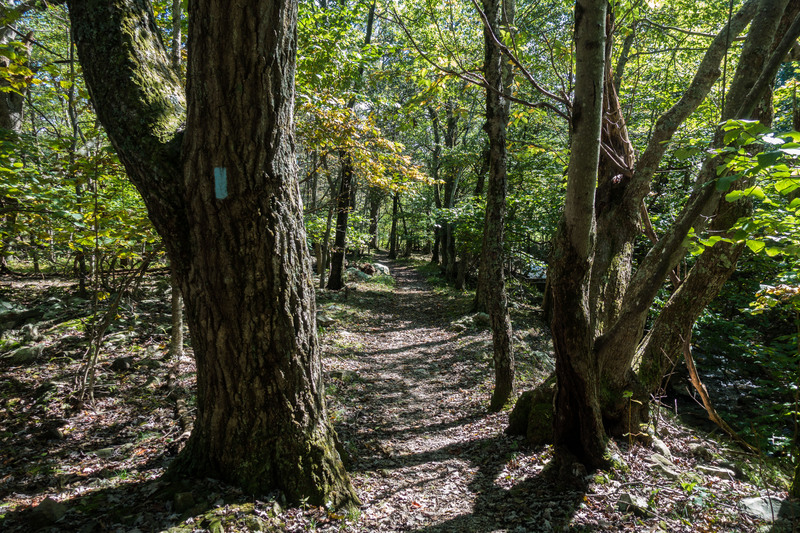 This trail leads to Big Meadows Campground in 1.4 miles, where we would cross Skyline Drive, then hike to Dark Hollow Falls. 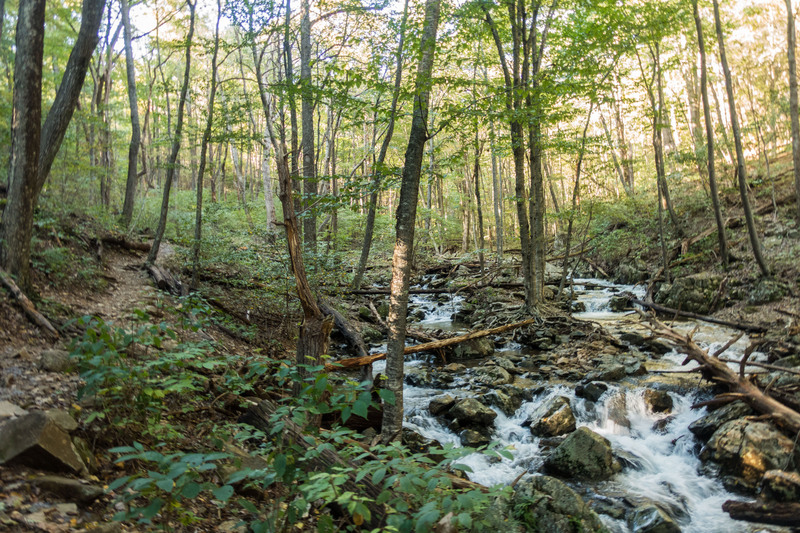 After the waterfall, we would hike Rose River Trail, which leads back to Skyline Drive and Fisher’s Gap. Trees surrounded us as we gradually ascended Skyland-Big Meadows Horse Trail. The sunlight streaming through the trees both relaxed and energized us. As we hiked, we noticed stone trail markers every ½ mile, which we assume are for horseback riders. 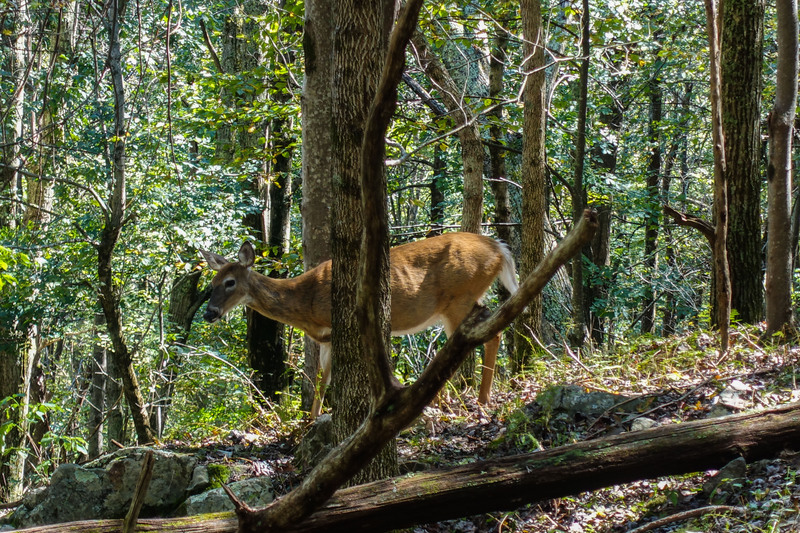 As we approached Big Meadows Campground, two deer – a doe and fawn – crashed through the underbrush. 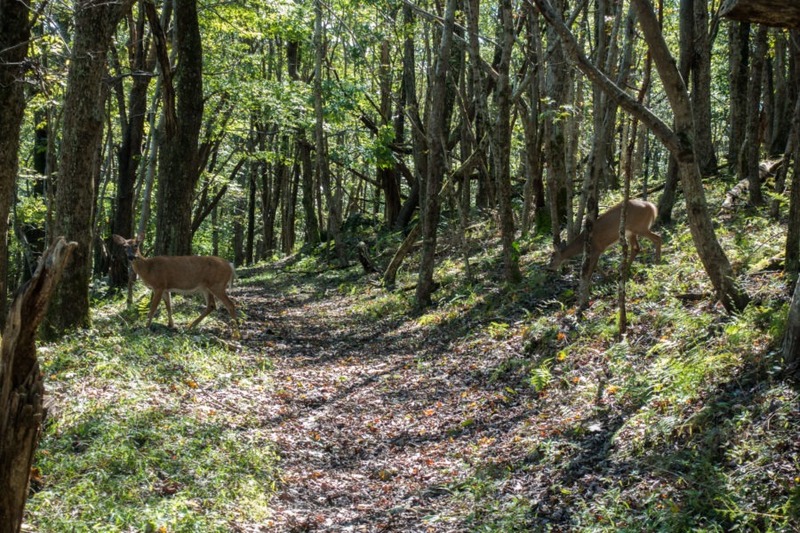 We must have startled them, because once they spotted us, they slowed down and started browsing for food by the trail. They’d clearly become accustomed to people. After observing the deer at a safe distance and giving them the right of way, we continued on. The trail continued until we reached a stream crossing. While easy for horses to cross, it’s a bit harder for humans. Looking to our left we saw a bridge further downstream. We followed the creek bank to the bridge, but we realized we didn’t need to cross it. If we had waded through the stream crossing, our route would have immediately turned left and then taken another left across the bridge, to where we now stood. So we were on Story of the Forest trail. As we walked, Hogcamp Branch flowed on our right. It would later join with other streams and become Dark Hollow Falls. A short 0.2 mile hike later, we got to Skyline Drive. Across the road we saw the Dark Hollow Falls parking lot, jam-packed with cars. We had seen a few hikers so far, but starting here we’d see more than we could count until we passed Dark Hollow Falls. 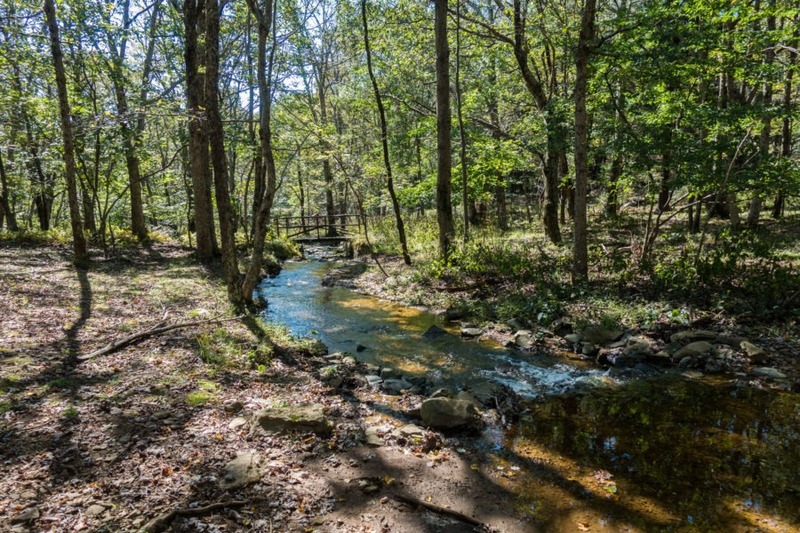 One could trudge through the water and then turn left onto Story of the Forest Trail, or follow the creek bank to the left to continue. Instead of going through the water, follow the creek bank to the bridge. Turn left onto the trail rather than crossing the bridge. We crossed Skyline Drive and turned left onto blue-blazed Dark Hollow Falls Trail, which rapidly descends. The entire way down to the main waterfall, 0.7 miles, Hogcamp Branch runs to our right. 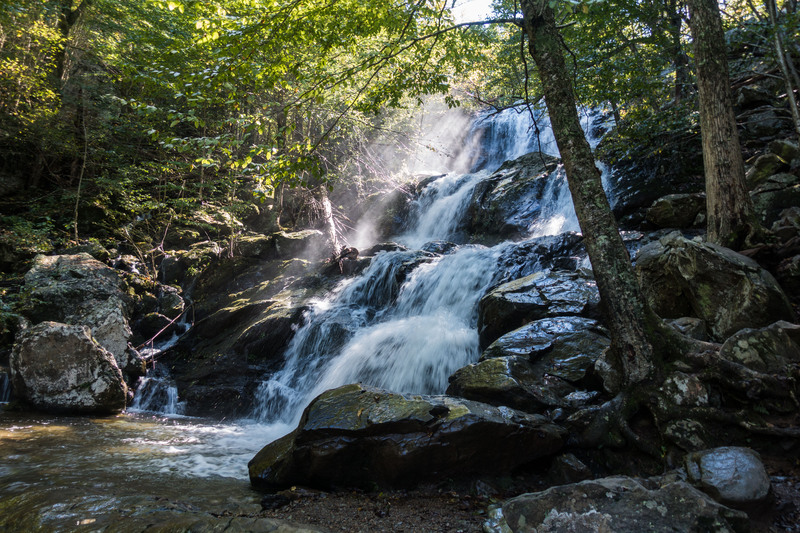 There are a few places that are worth a stop and/or photo on the way down, with small cascades or swimming holes. But we had to share them with lots of visitors, not that we expected to have it all to ourselves. The trail was wet and muddy from rain the previous day. It’s also rocky and steep in places, but otherwise manageable. The return trip would be more of a challenge due to the incline. We reached the upper falls overlook, and looked out over the wooden fence. Many visitors trudged past the upper falls, without stopping. They are worth a look, but you can get closer to the even more dramatic lower falls. 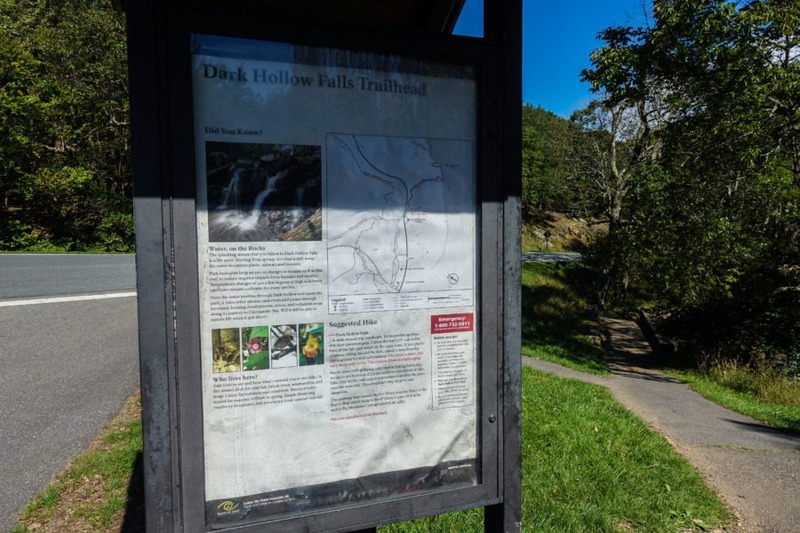 The trailhead sign for Dark Hollow Falls. The paved path down (to the right) is the start of the hike. Most people seemed to skip Upper Dark Hollow Falls, but it’s still a nice view. Dark Hollow Falls flows down multiple levels over 70 vertical feet. It’s been a rainy summer this year (2018), so the volume of water was impressive. We snapped some photos from a distance as we waited…and waited…for other groups to take their close-ups and selfies. Finally it was our turn, so we quickly captured the falls before another park visitor could jump in front of us. 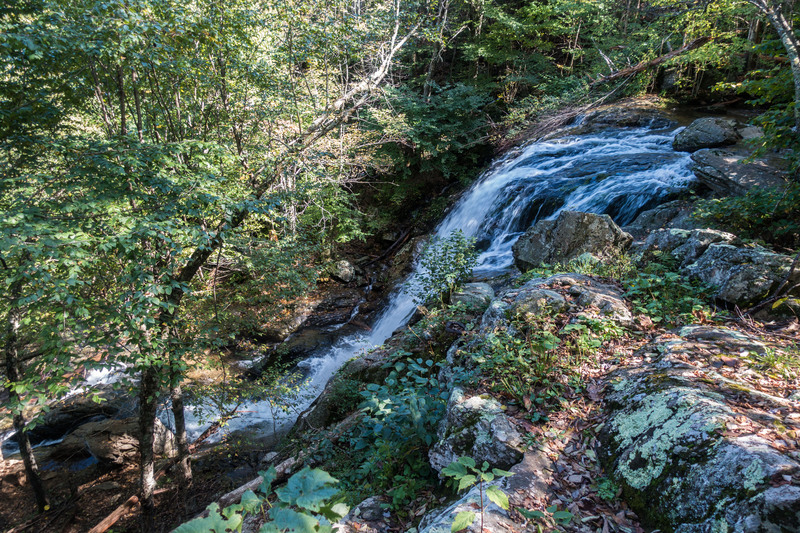 A wider view of Dark Hollow Falls. There were a bunch more people off to the right, waiting their turn to snap a photo. Before long, we moved on and were glad to leave the bulk of people behind. We wanted to eat lunch, but it definitely would not be at Dark Hollow Falls. 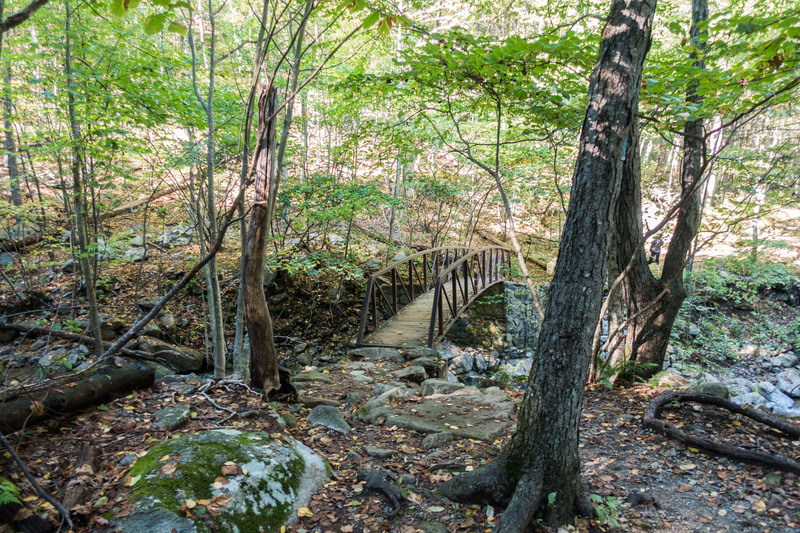 Most hikers retrace their steps here and go back up Dark Hollow Falls Trail. Not us, we continue going down and Dark Hollow Falls Trail ends at Rose River Fire Road. At the fire road, we turned right and crossed Hogcamp Branch via a bridge. As we crossed the bridge, we saw a peaceful waterfall on the right. It seemed like a nice place to stop and eat lunch. But as we sat down, a large and boisterous group of boy scouts stopped to take a break here, too. So we left, in search of a quieter lunch spot. Right after the bridge, we turned left onto Rose River Loop Trail. 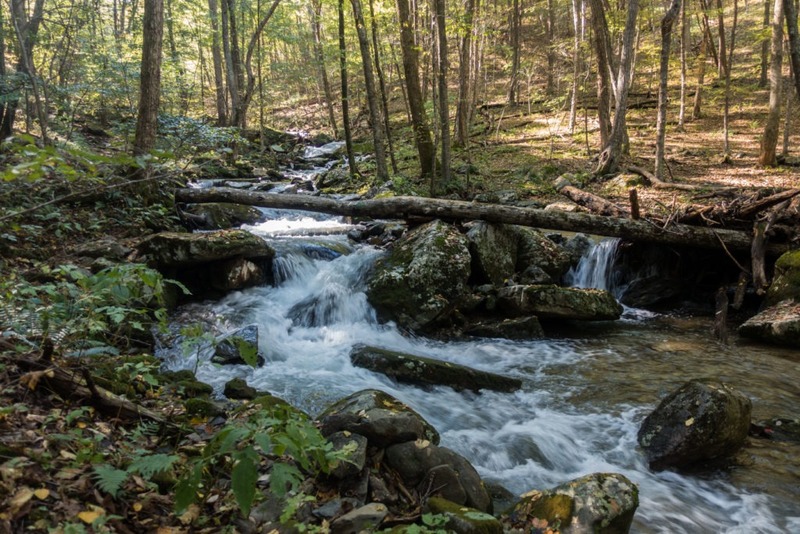 For a shorter loop from Fisher’s Gap, we could have also made a route with Rose River Loop Trail and Rose River Fire Road, though this route skips Dark Hollow Falls. We turned left here, onto Rose River Loop Trail. Rose River Fire Road continues straight. We continued our descent with Hogcamp Branch on our left. 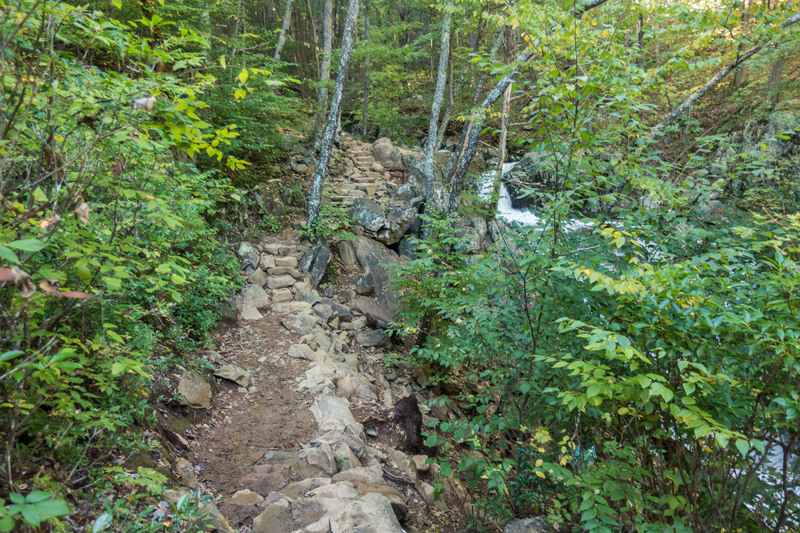 Rose River Loop Trail is less steep than Dark Hollow Falls Trail, but slick rock, mud, and water made the trail slippery. Trekking poles were helpful on this section. The trail was less crowded than Dark Hollow Falls, though we ran into a few other groups. Soon we found what we were looking for: a large rock by the stream where we could have lunch. We took a break and enjoyed the sounds of the water rushing by as we ate. Once satiated, we continued our hike along the gurgling stream. There are no big waterfalls on this section, but it’s pleasant with small waterfalls and cascades. 0.8 miles after Rose River Fire Road, we reached a picturesque bridge that goes across Hogcamp Branch. Soon after the bridge, we ran into an intermittent stream that we need to cross. Since there had been so much rain, this stream was flowing strong, but we got across without any trouble. 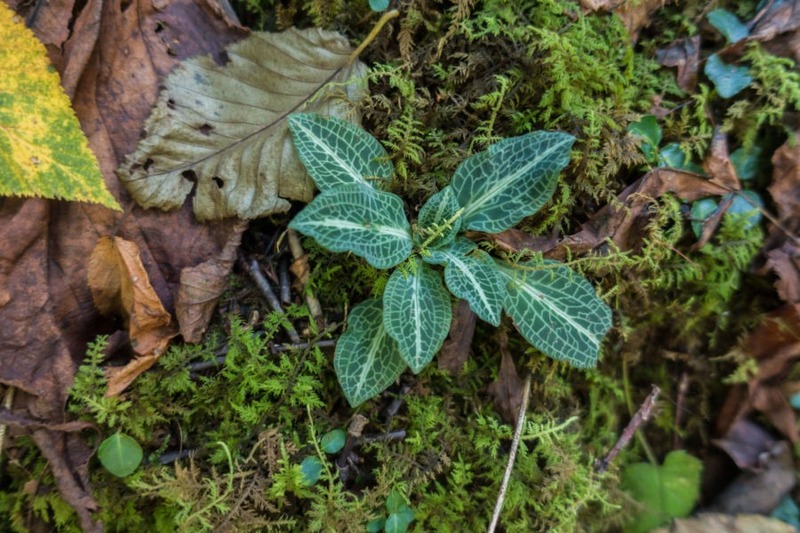 Rattlesnake Plantain (Goodyera pubescens) on Rose River Loop Trail. This orchid has small white flowers and blooms in the summer. At this point, the trail finally starts to head uphill with Rose River on our right. The initial incline was a bit of a shock to our systems and we were slow to make progress. But once in a rhythm, we made good time up to Rose River Falls. 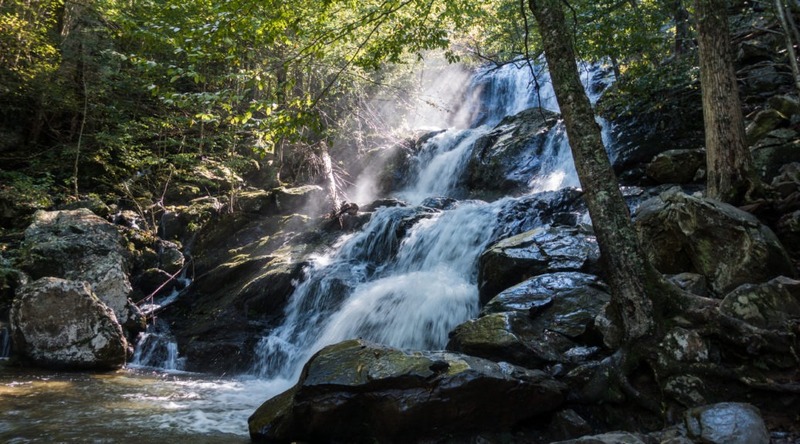 The waterfall itself is 67 feet high, only three feet less than Dark Hollow Falls. To my eyes though, it’s not as impressive. At the base of the falls were a few people that had hiked off trail and were outrageously loud and screaming. It diminished our enjoyment of the waterfall a bit. We would have lingered more if it weren’t for them. We continued our uphill hike and eventually left behind Rose River when the trail veered west. After 0.7 miles, we reached an intersection and were back on Skyland-Big Meadows Horse Trail. Only half a mile to go. We passed an older couple going the opposite way. They asked if it was worth it. Assuming they meant Rose River Falls, I said definitely! I silently hoped the loud people would be gone by the time they got there. 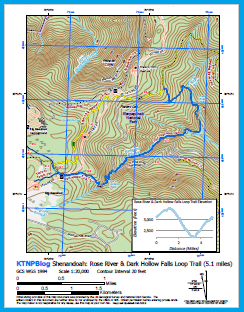 Skyland-Big Meadows Horse Trail intersects with Rose River Fire Road. We crossed the road, the horse trail continuing on the other side. And a few minutes later we were back where we started on Skyline Drive. 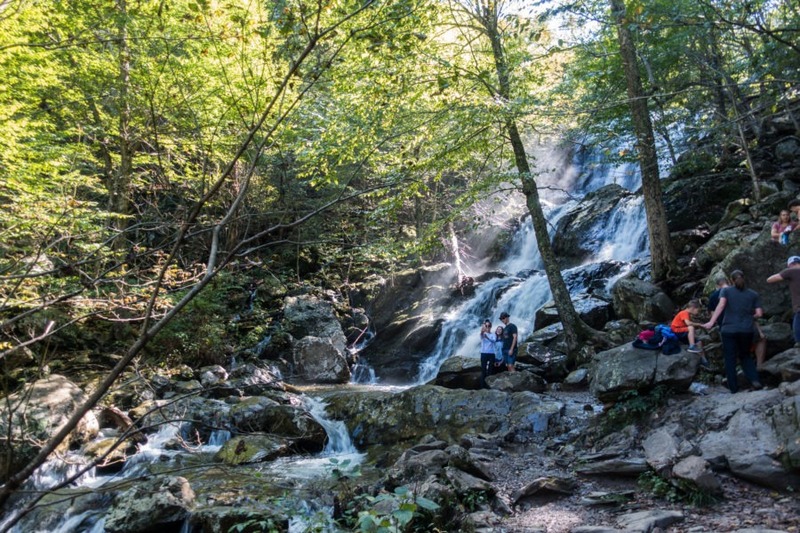 The waterfalls, which appear on many “best of” lists, are highlights of Shenandoah National Park. Dark Hollow Falls is more impressive than Rose River Falls, in my opinion. Just know you won’t have it all to yourself. Mile 0.0 – From Fisher’s Gap Overlook parking lot, head southwest, toward Skyline Drive. There is a crosswalk, but don’t cross it. Head right, uphill on yellow-blazed Skyland/Big Meadows Horse Trail. 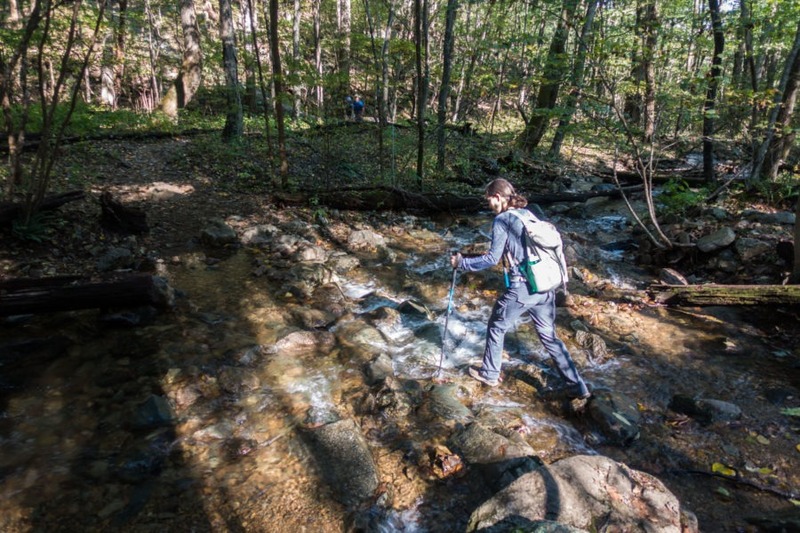 Mile 1.2 – You’ll see a stream crossing straight ahead. If the stream is low, cross it and turn left on Story of the Forest Trail, then cross a bridge. If the stream is too high, turn left and take the social trail to the same bridge. You’ll be on Story of the Forest Trail without needing to cross the stream. Go south on the trail, which is blue-blazed. 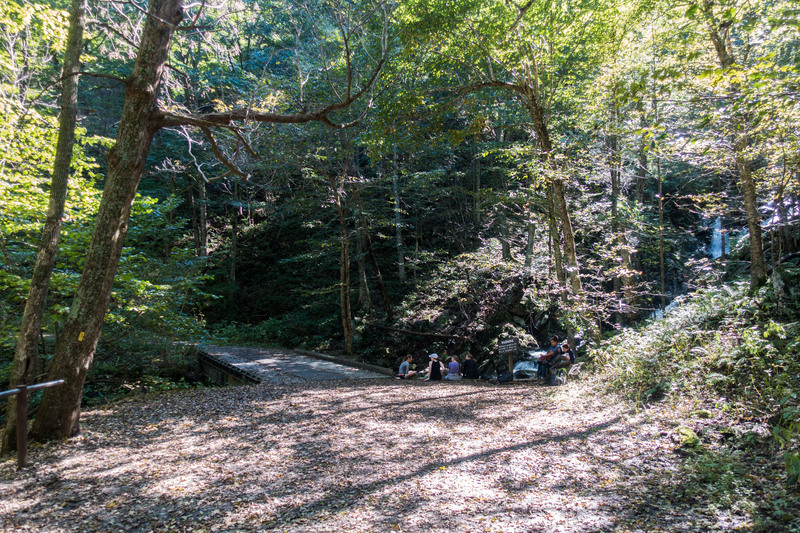 Mile 1.3 – Story of the Forest trail turns right here, across a stone bridge. You’ll go straight onto Story of the Forest/Dark Hollow Connector Trail. 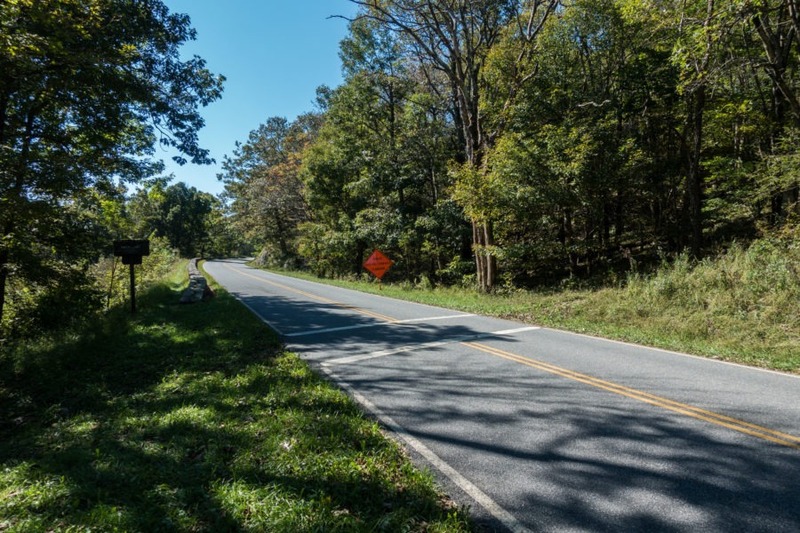 Mile 1.4 – Continue straight, going across Skyline Drive. 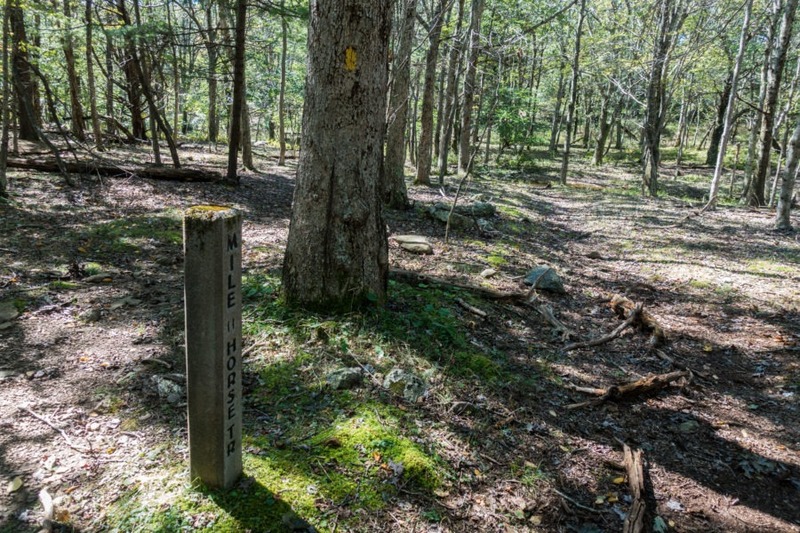 You’ll see the parking lot for Dark Hollow Falls and the Trailhead sign. Turn left onto Dark Hollow Falls Trail. 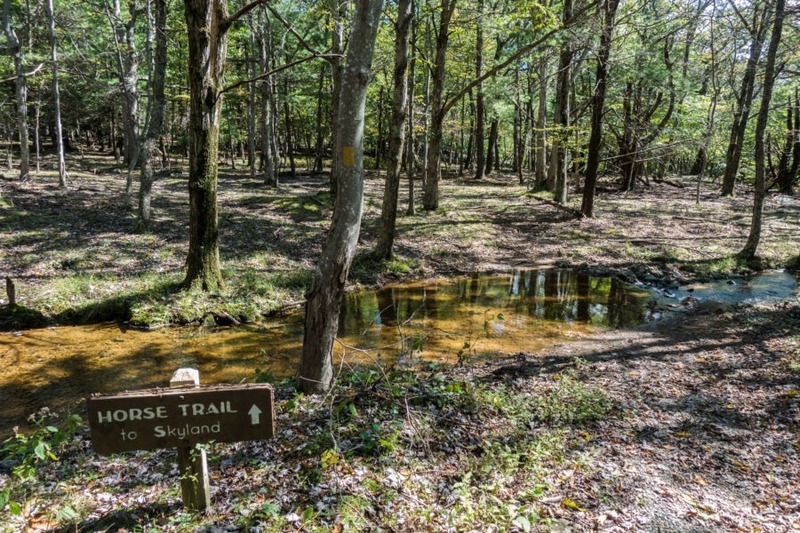 Mile 2.2 – Dark Hollow Falls Trail ends; turn right onto Rose River Fire Road, which is yellow-blazed. Head right over a bridge with another waterfall on your right. 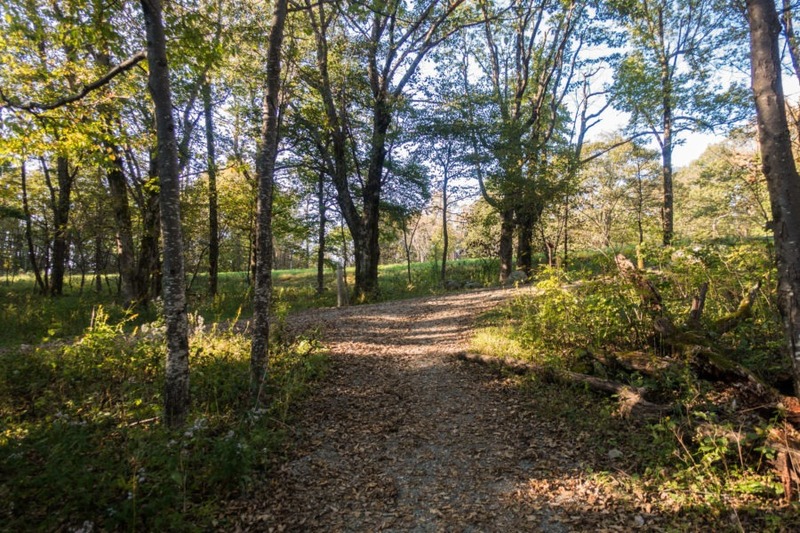 Immediately after the bridge, turn left onto the blue-blazed Rose River Loop Trail.